Swiss painter, draughtsman and teacher. His first teacher was his sister, the portrait painter and engraver Pernette Massot (1761-1828). In 1788 Massot visited Rome with the painter Jean-Pierre Saint-Ours as a guide. On his return Massot was commissioned to produce several charcoal drawings, including two miniature portraits in profile (c. 1790; private collection), probably depicting two young women of the Chavanne family. From 1794, in order to escape the turbulence of the French Revolution he sought refuge at Coppet with Jacques Necker, former French Minister of Finance under Louis XIV, and his wife Suzanne, who introduced him to Lausanne society, where he established a new clientele. In 1799 he became the director of the coles de Dessin in Geneva. In 1800 he was elected member of the Socit des Arts. Massot was the foremost painter of society portraits in his native Geneva in the early 19th century, frequently working in collaboration with his compatriots Wolfgang Adam Tpfer and Jacques-Laurent Agasse. 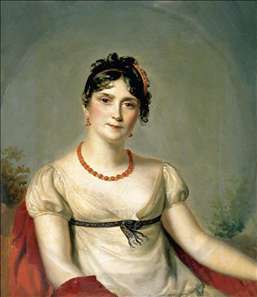 He painted the portraits of many important persons including Mme de Staël, Mme Rcamier, Benjamin Constant, the Empress Josphine, the Queen Hortense, the colonel William Wickham, Lord et Lady Sandon, Lord Breadalbane. During his tours abroad he met the most important contemporary painters, Franois Grard, Jean-Baptiste Isabey et Jules-Csar-Denis Van Loo in 1807, in Paris; Fleury-Franois Richard in 1812, in Lyon. During his long stay in England he met Thomas Lawrence in his London studio. See more details about "Portrait of the Empress Josephine of France"